The UK has a skills shortage in the horticultural sector, despite this area of the economy being really important both to the wealth it brings in to the country and for our self sufficiency and food security. Botany was phased out of the schools curriculum many years ago and as the current generation of horticulturalists and plant scientists retire they are not being replaced in sufficient numbers. I'm not suggesting we start hothousing our toddlers into a career in plant science, but by providing them with lots of varied experiences we can at least give them a flavour of the huge diversity of different things they could do in the future and perhaps nurture their preferences, fleeting and changeable as these interests will usually be in the early years. 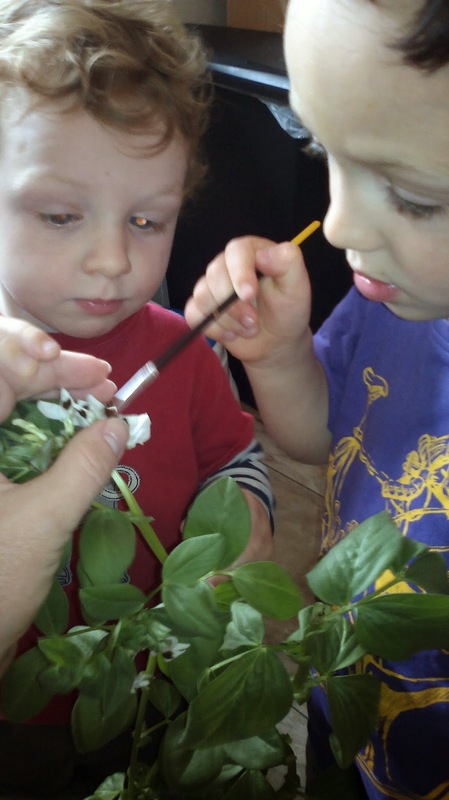 Growing anything at all with little ones is an immensely rewarding activity that you both will enjoy, even if it's cress seeds on damp cotton wool. The bean in a jar activity was one of the very first things I ever blogged about here and a year on this is how we have extended our early investigation. Last year we grew our bean in a jar and did some work on recognising the parts of a plant by drawing and labelling the roots, stem and leaves. This year we transferred our bean seedling from a jar to a transparent plastic yoghurt pot filled with soil so we could continue to watch how it grew. The pot is on Ollie's window sill, along with our tomato seedlings, so he can keep a close eye on their progress. When the bean plants were about a foot high I pinched out the tips to see if I could encourage them to stay small and bushy. A week later Ollie announced with great excitement that his plants had flowers on them. We had been reading a book from the library about a beaver growing beans on his window sill, so the boys took it as completely normal that they should grow and flower so well. from a different flower on to. We talked about how every type of plant has it's own special shape of pollen so only pollen from a bean plant can make a bean grow. Both boys had a go at 'tickling' the pollen around the flowers, waiting patiently to take their turn at it. 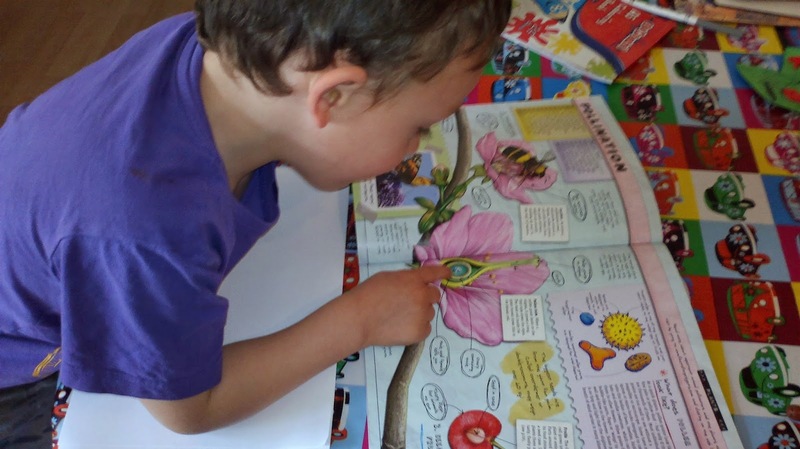 Afterwards we looked in Ollie's plant book (Inside Plants by Miles Kelly, bought from Lidls for about £2). We looked at how the pollen gets stuck onto the stigma and then sends a tube down the style to the ovary where the male information from the pollen joins up with the female information so a new seed can start to grow. I use the words as I've written them above as it seems to be a level that Ollie understands. We don't want to lose their interest by droning on about things that are incomprehensible, but I think we often underestimate what children can understand if we present information simply and regularly. Ollie used his book to draw what was happening when we pollinated his plants. He did it a step at a time, sometimes asking me to trace over the book with my finger to show the next bit to add. I labelled the parts for him with Ollie helping when he knew the part and drawing on yellow arrows to the correct bits. 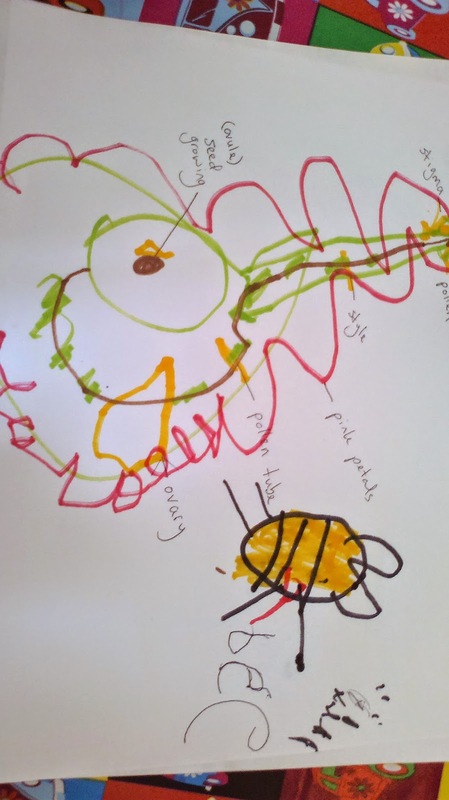 Then he drew a bee to show how it all should have been done if we hadn't been tickling his plants with a paintbrush. As much as possible I let Ollie lead and don't fuss if things aren't quite right - the pink petals on his flower for example are the way he has interpreted them rather than being an exact copy of the picture in the book - this is good and he gets praised for lovely pink petals, not told they look different in the book! If you're starting to over control what your kids produce stop, sit back and just marvel at what they're actually showing you about how they interpret what they see. 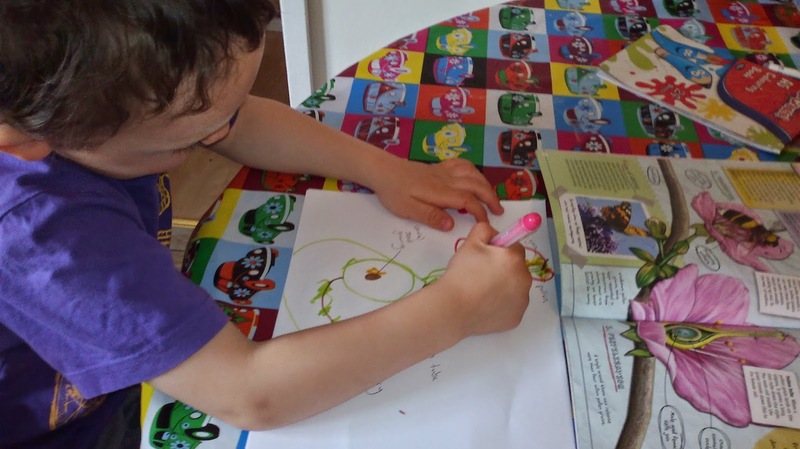 When we looked at the book together I asked Ollie if he'd like to make a science drawing about his experiment - if he'd said no that would have been it for the day and we would have done something else. At no point should there be any pushing of a little one who isn't interested or isn't ready. As soon as I mentioned that you can hand pollinate flowers with a paintbrush Ollie wanted to try, and pestered for two days before we actually got time to carry it out (he wanted to do it after nursery on the two days he attends, but as he was playing box forts with Matt and Toby both nights after dinner I didn't want to interrupt that time together by reminding him about the plants and waited instead until we had a morning free). There's a line between providing stimulating activities to keep kids entertained, and pressurising little ones into things they're developmentally not ready for. Ollie happens to love this stuff at 4 years old, and he did at 3 years old too, but other kids this age would be happier kicking a ball or building bricks or whatever, so the activities I do are only here online as ideas to try if they suit you and your kids. Every child is so different, all we have to do is try to provide them with opportunities to express that. Toby at 2 enjoyed tickling the flowers, and then when Ollie was making his picture Toby was doing his own picture with pens and stickers in a much more patient and methodical way than Ollie did at that age, so even kids raised together will have different preferences and abilities and I don't want to add to the pressure parents have of feeling that kids 'should' be doing certain things at certain times. Lots of kids aren't developmentally ready to hold a pen comfortably by 4, let alone write words, so there is a great deal of debate at the moment about the pressures on small children with proposed testing to be brought in for very young children to test literacy and numeracy. The only important thing kids 'should' be doing in the early years is playing, and playing as regularly with parents and with other children as possible. If your kids happen to show interest in science, maths, art, history and so on then that can become part of your play. When he does his experiments and 'writes them up' Ollie is playing at being a scientist in the same way that ten minutes later we will all be playing at building forts together and chasing away imaginary invaders. The minute you stop playing and get out the flashcards to hothouse your little one, you are in danger of turning them off to the big fact of life that so many people are missing - playing is learning and learning should be fun so we want to keep doing it for our whole lives because it brings us joy.